Best, Cool & Fun Games’ Ant Smasher is rather self-explanatory: smash the ants before they can wiggle their way over to your picnic table and crawl all over your food. With this simple objective, you can let loose all of your frustrations over creepy crawlers on these app-generated creatures while satisfying that primitive inner urge to destroy. All of this and you don’t even have to get your hands dirty. Destroy ants and the occasional fly to gain points, while avoiding the bees. If you squash a bee and get stung, it’s game over right away. Every once in a while a bonus leaf or 1up will make an appearance so make sure to smash those as well for extra points or lives. The game comes with four options: Classic, Multiplayer, Fun and Kids. If you choose Fun mode, touching a bee will cause you to lose one life instead of a game over. 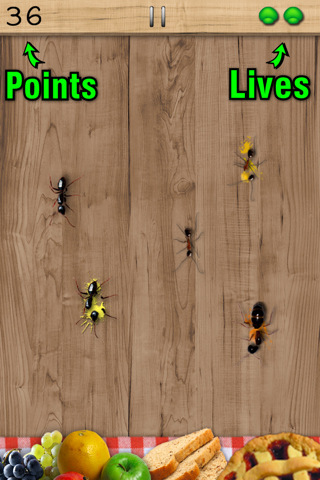 With Kids mode, the speed and acceleration of the ants are slower; touching a bee will only cause you to lose one life. A scoreboard with achievements and a leaderboard keeps track of your victories. If you get bored of the picnic table background, you can change it to a photo from your own private gallery. There is also a Shop option if you wish to purchase an ad-free version of the game, or extra lives. The graphics are light and simple, although still disgusting enough to make the child in you–or the child playing the game–grin in perverse delight every time an ant goes to pieces under your finger. The music and sound effects are rather amusing, with loud squashing sounds every time you destroy an insect or a cry of pain every time you smash a bee. Unfortunately the game did not hold my attention for very long, despite the fact that there was some challenge to it as you moved through the levels. The game might be made more attractive with brighter and cuter graphics and music; maybe more prizes or obstacles to make it really interesting. Ant Smasher will probably be a bigger hit with kids, particularly boys, who don’t require fancy graphics to be wowed–they just want to watch the ants spurt guts and separate into pieces under their little fingers. This disgustingly fun game is free, but with in-app purchases that will probably make your life easier. 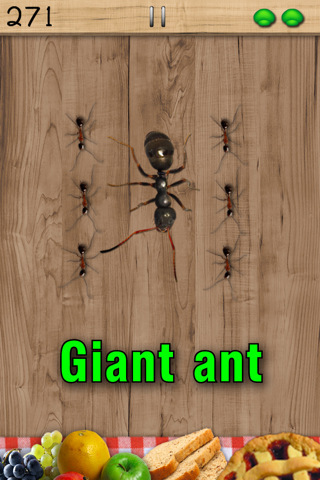 Sample the free version of Ant Smasher on your iPhone. AppSafari review of Ant Smasher was written by Julie Guan on March 16th, 2011 and categorized under App Store, Free, Fun, Games. Page viewed 5416 times, 1 so far today. Need help on using these apps? Please read the Help Page. This is such an addictive game. been playing it on my android tablet before and it still is addicting. this is one of my faves along with Tapslayer: alice in zombieland.